“Gullah/Geechee Volunteer Month” began as a true journey through my own community. It was wonderful to see the place again through the eyes of students that had never been to St. Helena before. We walked the road together and sat and talked in different spaces which as invigorating. However, the most stimulating thing was the way the day for work began-helping with the restoration and renovation process for Penn. 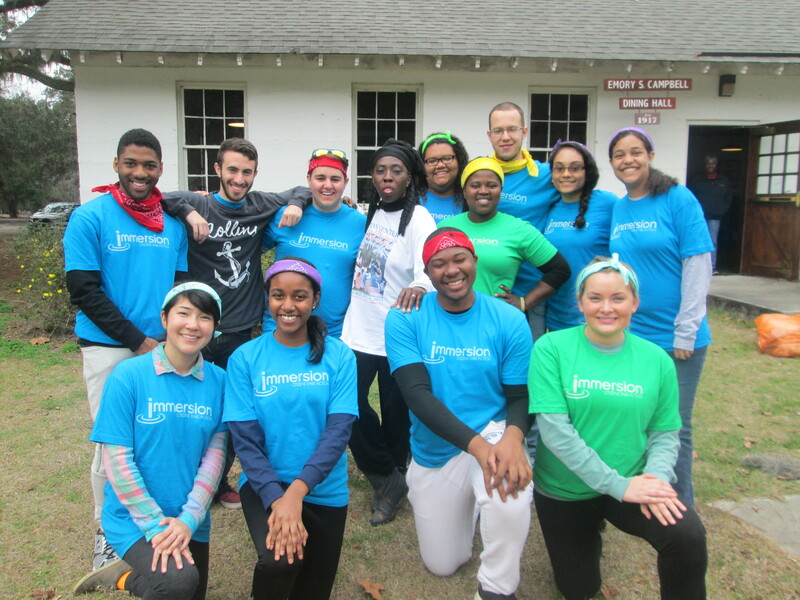 It has been years since I first danced the grounds of Penn which is now Penn Center, Inc. It was initially Penn School which is the first trade, agricultural and normal school for freedmen (as both previously enslaved African women and men were called) in America. I can recall the first plaque that i ever won from Penn for writing the history of this place for an essay contest. Before today, I never thought of that possibly being why I have the history so ingrained in my mind and my heart. However, I watched new pages of history getting written in the hearts and the eyes of the college students from Rollins as I passed on to them the knowledge of the importance of this institution to ourstory. This place represents progress and pain, trials and triumph for the Gullah/Geechee community and for my family that attended here and helped to support this institution. I often think of the ancestral hands that built these buildings and that of the churches along the same road including the Chapel of Ease. For the first time that I can truly recall, I drove there and got out alone. 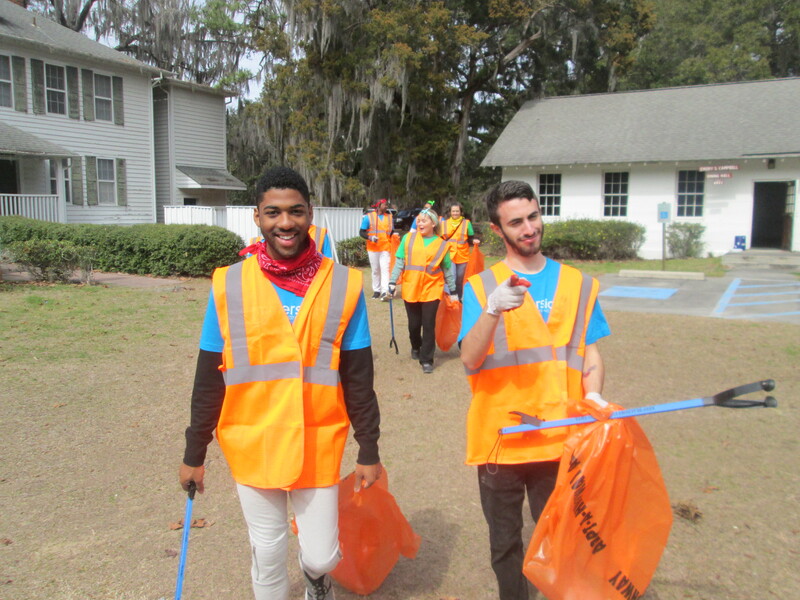 I put on my work gloves and grabbed a “Keep Beaufort County Beautiful” bag and got to picking up garbage that has been discarded around the historic site. As I walked, I felt an energy and suddenly, I thought of Mr. Sam Doyle who lived just down the road and was a Gullah/Geechee artist that is now a world renown folk artist. When I worked with the High Museum of Atlanta’s curator on the Sam Doyle’s exhibition, I learned of how Mr. Doyle used to clean the grounds of the Chapel of Ease the same way I was doing now. So, it made sense that I would feel his presence and then recall his smile. Walking in the literal tracks of Mr. Doyle made me recall that Penn Center’s York W. Bailey Museum will be hosting the Sam Doyle’s Art Exhibition Opening on Friday. March 13, 2015 at 6 pm which will continue as part of the the new “Second Saturdays” wherein the community can visit the museum for FREE from 11 am to 4 pm on Saturday, March 14, 2015. I thought this was extremely appropriate that this space would be giving to the community in Sam Doyle’s name as he had given to the community throughout his life. I drove past the York W. Bailey Museum which is housed in the Cope Building now and appreciated seeing the restoration progress that was going on at the Butler Building where the museum got its start. I remembered when I would spend Saturdays in that building hosting groups and walking them around the grounds as I shared the history of each building that was located there and met up with many of my elders that had attended the school along the way. Many of them have now passed on and I pray that they were looking down and seeing that their living examples of volunteering here were not in vain as I and the students now walk the grounds and volunteer our time to keep this historic landmark alive and have it thrive in the future. 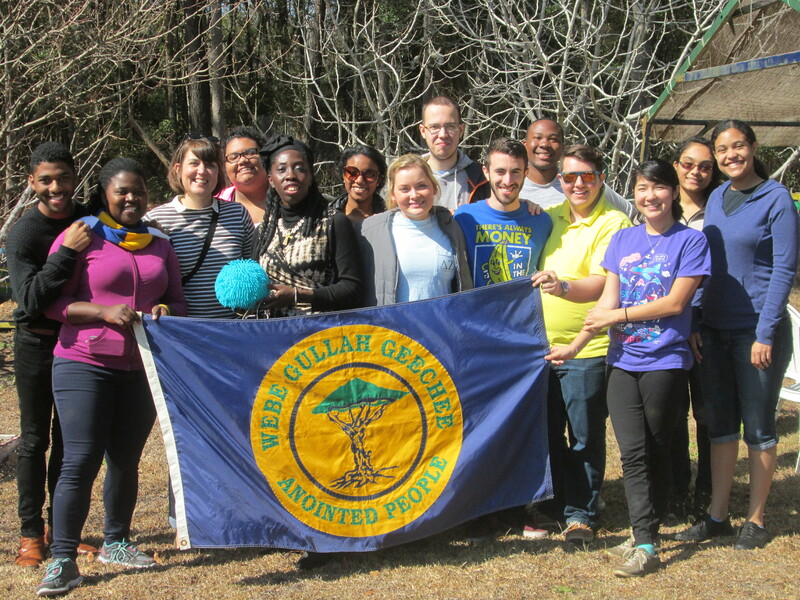 When I planned for the arrival of the students from Rollins College and mapped out the work plan for the first week of “Gullah/Geechee Volunteer Month,” I did not anticipate the way the road through St. Helena would take on a new look and more meaning for me. Yet, at the end of the day, I am thankful for the vision to have seen it, for the blessed company that I took the journey with, and for the ancestral spirits that met me along the way. Like Ice Cube, I am led to say, “Today was a good day!” Tenk GAWD fa disya road wha bin lead me bak ta de Gullah/Geechee famlee! Queen Quet, Chieftess of the Gullah/Geechee Nation (www.QueenQuet.com) with volunteers from Rollins College on St. Helena Island, SC in the Gullah/Geechee Nation.